Cut several black, purple and orange circles about the size of a dinner plate. You will need mostly black, but have a few of the other colors ready just in case. Find an image of spiders you like. I searched Google for “free spider clipart,” found one I liked, put it into a word document and copied it several times. 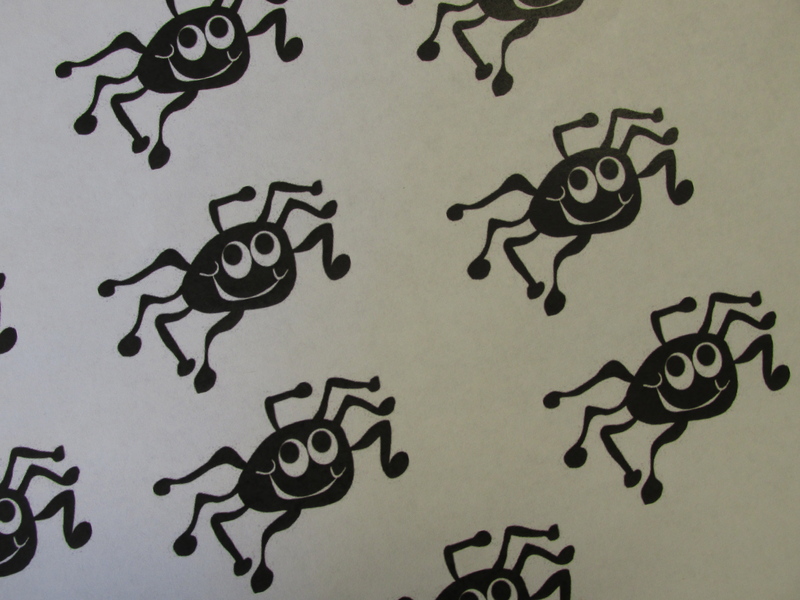 Cut them apart for individual students to use later with their glyphs. Each student’s answer will determine what color his/her hat will be. Students that know their costume will use black paper for the hat. Students who are unsure use purple paper and students who will not be dressing up use orange. As you can imagine most of my students knew their costume and used black paper. Only one student was unsure and no one was skipping the costume this year. Once each child has his paper, he cuts it as shown below. The smaller piece of paper is set aside for use at another time. 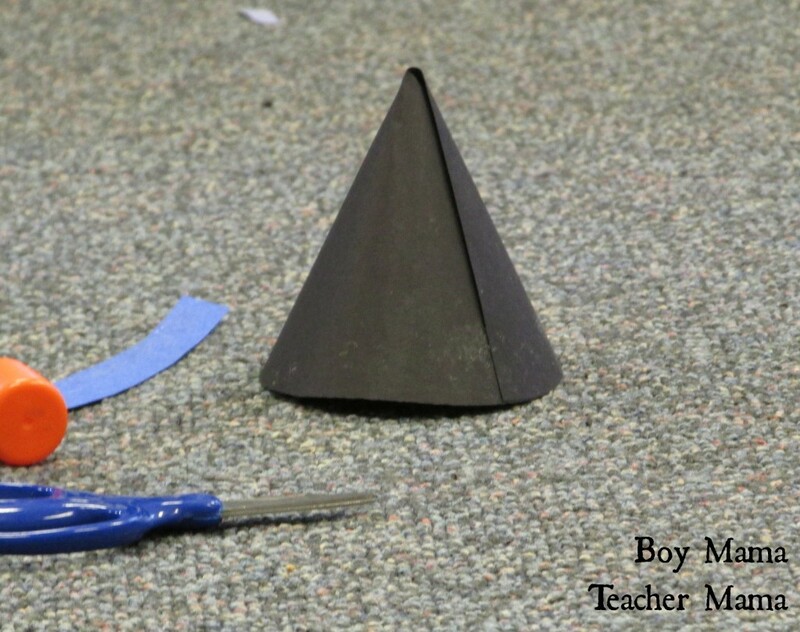 He then rolls his paper to form a cone shape and glues the edges together. 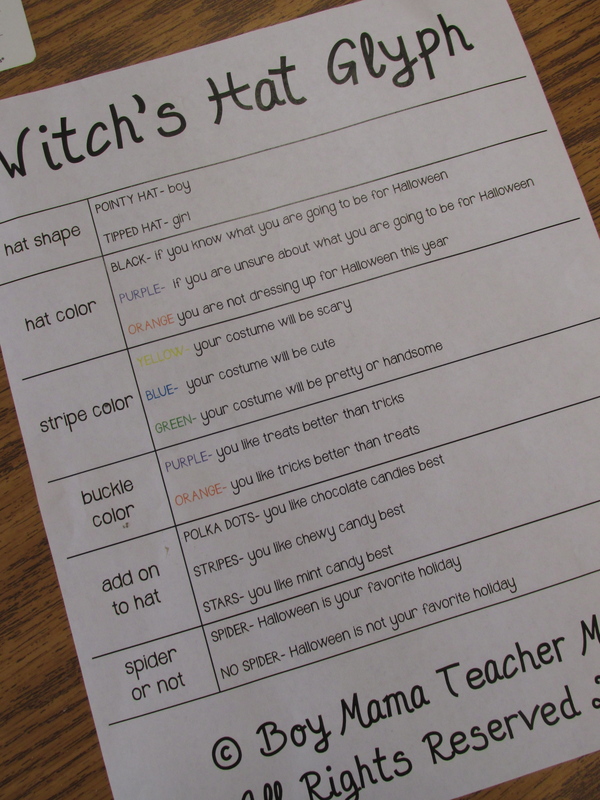 Once each student’s cone is complete, continue asking the other prompts on the list to determine what items should be added to their witch hats. “Will your costume be scary/cute/pretty?” Scary costumes get a yellow band around the hat, cute costumes get blue and pretty get green. This part was a little tricky for the kids to do on their own, but with some help and some problem solving they all were able to add the band to their hats. 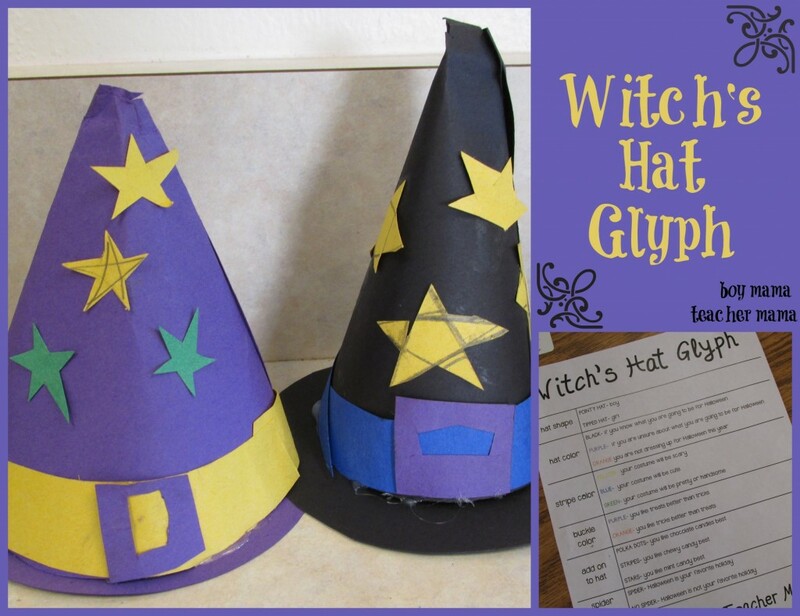 We continued on through all the witch’s hat glyph questions until we were done. 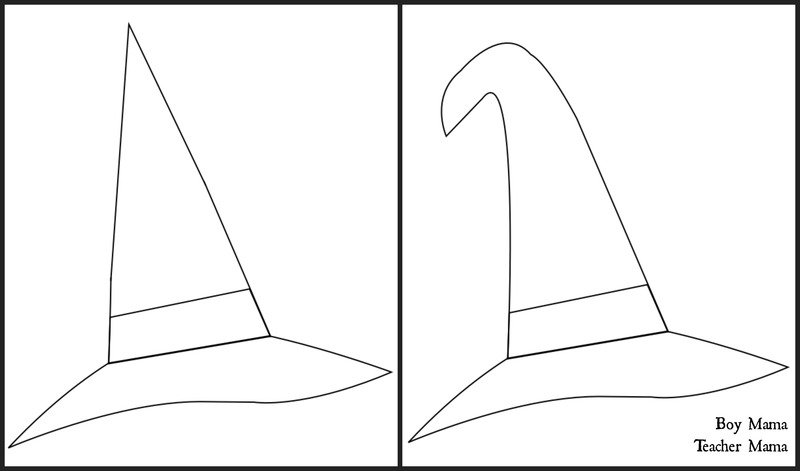 We then added the hat brims and voila, our witch’s hats were done. Making the hats was fun, but so is using them to find out about our classmates. Here are a few examples of what kind of information we can gather. Below shows which students feel that Halloween is their favorite holiday because they added a spider to their hats. Students who liked a different holiday best, left the spider off. The photos below show the hats sorted by band color which explained above tells whether that student’s costume would be scary, cute or pretty. Note: The glyph activity includes two other questions not shown in this post. The questions that can be asked are endless. And, if you are so inclined, can be graphed as well. 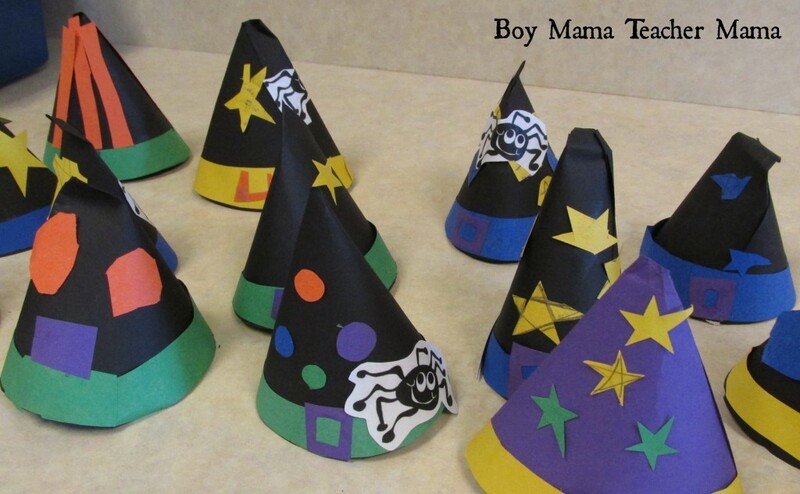 If creating a 3D hat is not something you have time for in your classroom, but still like the idea, the activity comes with paper hat pages that you can use the same way. See photo below. 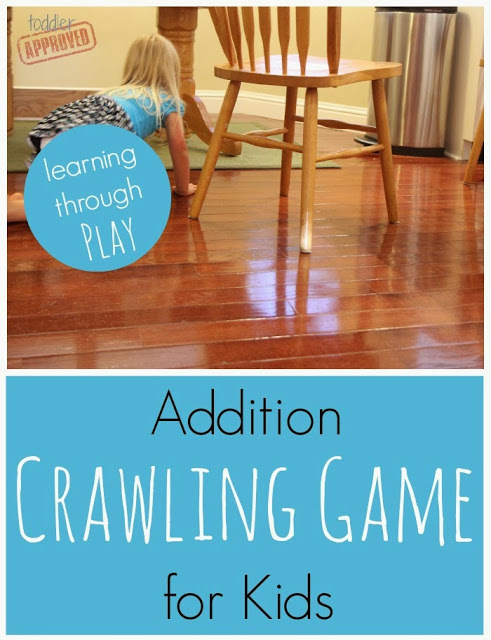 Looking for a few fun ways to teach your child to recognize his numbers? To count? To add? Try this idea from Toddler Approved! Another great way to practice a very important skill- reading sight words! Getting kids moving and reading can really help solidify learning. Yah! Lexie is excited to see her Witch’s Hat! 🙂 I love that she was the only one with a purple hat!! I’m not sure I ever used glyphs when I was teaching. Clearly we were missing out! 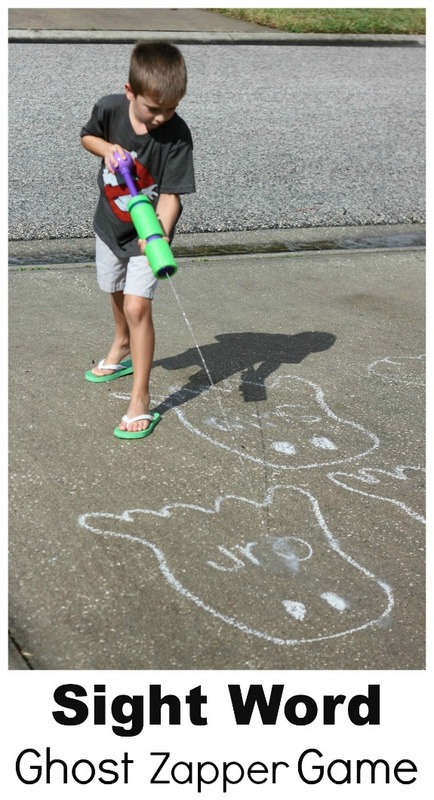 Thanks for sharing this idea- looks like a lot of fun! I love glyphs, they are SO good for a crowd of kids. Yours look so creative. Thanks for co-hosting Afterschool! I LOVE Glyphs and this is just adorable. My second grader will love it. I saw you had an afterschool linky up, but didn’t see these hats on the linky on our site, so glad I stopped by. Now I will have something to do with my kiddo when she gets home from school tomorrow. Thanks for stopping by! I just finally linked up my post. Long day! Enjoy!